When our bread maker broke down we stopped making bread, but we really missed that rich texture we had grown to love. 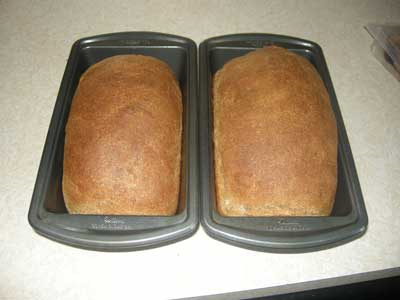 I started experimenting with making bread, but it seemed that it would only turn out right if we used white flour, and we wanted to use our wheat and have that nutrition. I finally discovered that gluten is the secret ingredient for fluffy bread when you use only whole wheat. I found a recipe I liked online, and changed it a bit to better fit our needs. Whenever I make this recipe for rolls at parties, I get a lot of compliments, and in our home it is loved by all. Enjoy! Put 1 1/2 tablespoons of yeast in a large bowl. 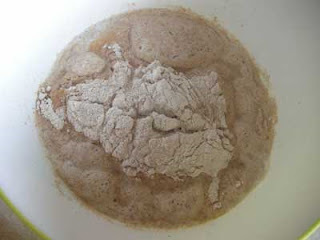 Pour the water over it, and dump 2 cups of flour on the water mixture. Do not stir, but let it sponge for 15 minutes. 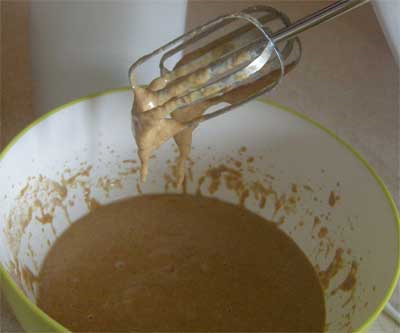 Stir with a kitchen mixer, then add salt, gluten, oil, and molasses. 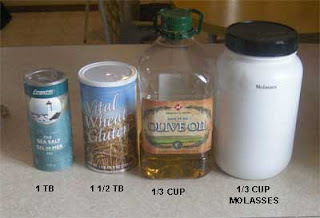 I find it helpful to pour the oil in first and then use the same container for the molasses. The oil makes the molasses pour out really slick. Stir again. Notice the dark color of the dough. It will be much lighter if you use honey. I like to use molasses because it's cheaper than honey, and it is rich in iron, which is something I really need with my pregnancies. My husband doesn't usually care for molasses, but he prefers it in my bread. Add as much flour as you can stir in with the mixer, about two cups. 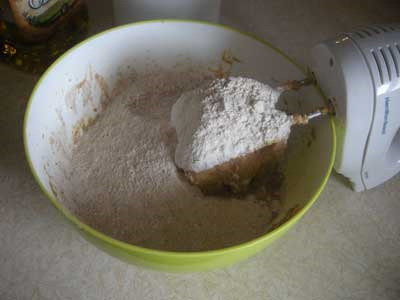 Set the mixer on its side, and add two more cups of flour. Then have an extra cup of flour ready to go as your hands will be sticky. THEN take the mixers off. 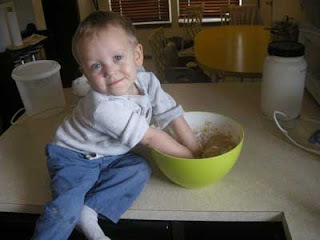 You will have messy hands after you pull the dough off the mixers, and you will have messy hands as you knead the dough. I used to be really intimidated on what kneading was, and how to do it properly. Kneading really is just mixing the dough by hand. It's so easy, my toddler can do it! Well, sort of, he loves to help. I usually have to add about an extra 1/2 cup of flour to get the right consistency. 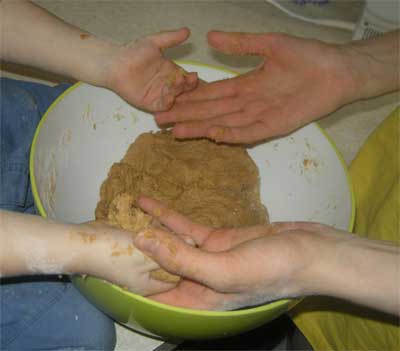 You know the dough is about ready when it starts sticking more to itself than your hands, and you find your hands start "self-cleaning", as in the picture below. 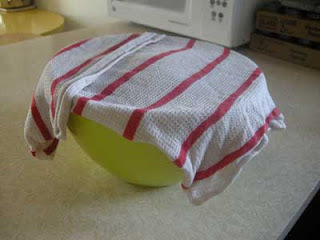 Wet a dish-cloth with hot water, wring it out, and place over the bread bowl. Wait until it has doubled in size, about 1/2 hour. In my bowl, I know it's ready when it starts pushing the cloth up. Punch the dough down and prepare the dough for its purpose. 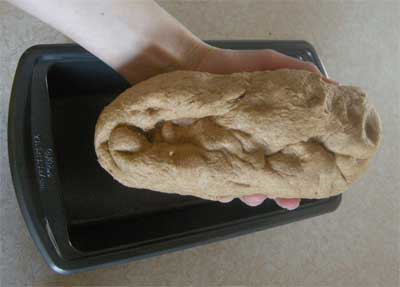 You can make two loaves of bread, 24 rolls, or two or three pizzas with it. You could also use it for cinnamon rolls. I have successfully frozen this dough and used it later for pizza and dinner rolls. If you want to freeze it for dinner rolls, separate the dough into little balls and freeze them like that on a baking sheet. For bread, eyeball the dough and divide into two. One of my loaves ended up being a little bigger than the other loaf, and that is just fine. 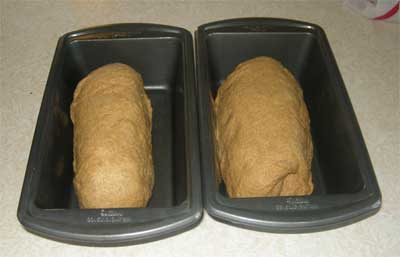 I wrap the dough inward into my finger tips and when I have the right size, I slap the dough around the edges to make it smooth and put it into the bread pan. The bottom looks a little weird so I share a picture. After the dough has risen again, and after it bakes, this crease virtually disappears. Grease the bread pans and place the dough inside. I like to pour a few drops of olive oil into the pans and spread it with my hands. Then my hands are nicely greased for punching the dough down. Re-wet the dish cloth in hot water, wring, and place over the bread and let it double in size again, about another 1/2 hour. When it starts to push the cloth up, preheat the oven to 350 F.
AFTER it is preheated, put the dough in and cook for 30 minutes. The bread is done when you can tap it and it sounds hollow. I never have had doughy or burnt bread at 30 minutes though. You may have to adjust for your altitude. I live in the Rocky Mountains. Enjoy! This bread is really yummy! Sometimes I have ran out of flour during the last kneading phase, and so I have added quick oats or white flour in its place, and the bread turned out fine. The dough will be a little bit stickier if you use oatmeal, but the oats will absorb the moisture in time, so this is okay. You can also add a handful of raisins during the kneading phase. I like to add 1/2 tablespoon of cinnamon with the gluten and salt if I'm going to make raisin bread.